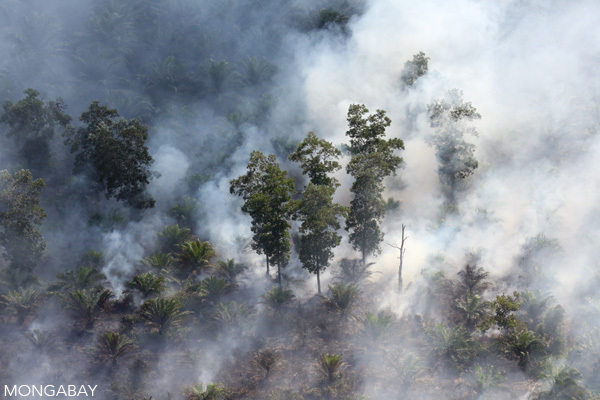 Forest set alight to clear land for oil palm in Riau’s peatlands June 3, 2015. Photos by Rhett Butler. 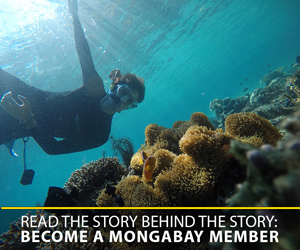 With global sea levels going up at a rate of about 9 millimeters per year, the livelihoods of many coastal people in the world look increasingly threatened, especially in those parts of the world with limited financial or technical means to adapt. A rate of a thumb-width of water per year may not sound like much, but the half to one meter higher water levels mean that many coastal people will have to abandon their homes and fields before the end of the century. Indonesia with its countless low-lying inhabited but often poor islands will likely be one of the more affected countries in the world. In a recent report by the World Bank, for example, Palembang, in Sumatra, made it onto the top-10 list of most vulnerable cities when measured as percentage of GDP. As if these developments weren’t scary enough for Indonesia’s coastal people, a new report indicates that people in the coastal parts of Kalimantan, Sumatra and Papua could be in even bigger trouble. The study commissioned by Wetlands International and implemented by Deltares looked at the rate at which coastal peatlands are decomposing, sinking and increasingly becoming flooded. The research was conducted in Sarawak (Malaysian Borneo) but is as relevant to the many coastal peatlands in Indonesia. 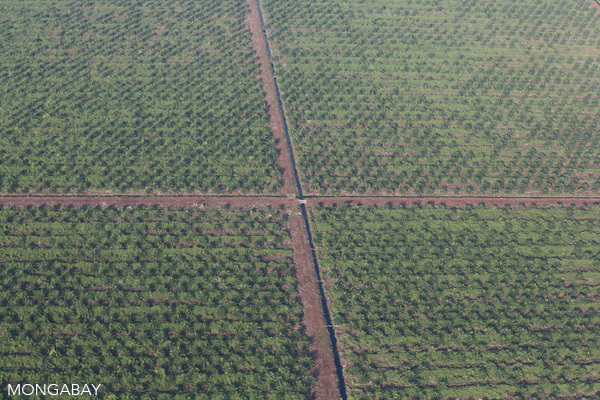 Industrial oil palm plantation on peatland in Riau, Sumatra. Peatland is not really ‘land’ in the common sense but an unstable mix of water (over 90 percent) and organic matter from partly decomposed plant material. As soon as these peatlands are drained, mostly for oil palm agriculture, these peats start to decompose, ultimately turning into carbon dioxide, one of the main greenhouse gases ultimately pushing up sea levels. Importantly, this decomposition inevitably leads to rapid land subsidence, and inundation and loss of agricultural production is common in such areas. Between 2000 and 2014, the 850,000 hectares study area saw an increase in the cover of industrial oil palm plantations from 6 percent to 47 percent, while the area of swamp forest decreased from 56 percent to less than 16 percent. The remaining area consisted of drained cropland, including smallholder oil palm plantations and degraded forest. The study found that 42 percent of current industrial plantations in the study area will experience problems associated with reduced drainability by 2034, and 56 percent by 2059. In addition, 18 percent of the area was already frequently flooded in 2009, but this will increase to 27 percent by 2034 and 64 percent by 2109. These high flooding rates basically mean that most of the peat swamp area will lose all of its agricultural production within the next few decades. The report concludes that nearly all peatland in the area is expected to be lost for production, much of it within decades and most within the next 100 years. The interesting thing is that the study actually confirms what the Malaysian government had already concluded in the 1980s: these peatlands are fundamentally unsuitable for agriculture. This mirrors several centuries of unsuccessful development of peatlands in the United States and Europe, where peatlands are being abandoned and rehabilitated. But despite these insights, Malaysia and Indonesia are the only countries in the world still attempting large-scale agricultural expansion on peat. I am scratching my head in slight bewilderment at these developments. If governments understand that agriculture development in coastal peatlands will ultimately fail, then why is it still attempted? I guess for the oil palm developer it might still mean a few decades of production and high yields, and after that they will simply abandon the land and take their money elsewhere. For smallholders and other non-industrial farmers this may however not be so easy. Their fields are often located close to the rivers where their villages are. This means that their plantations and gardens get flooded out much earlier than the industrial plantations which are often situated on the higher parts of peat domes. There are already many such examples in Indonesia where community plantations and other farm land in low-lying peatlands have become unproductive because of flooding. 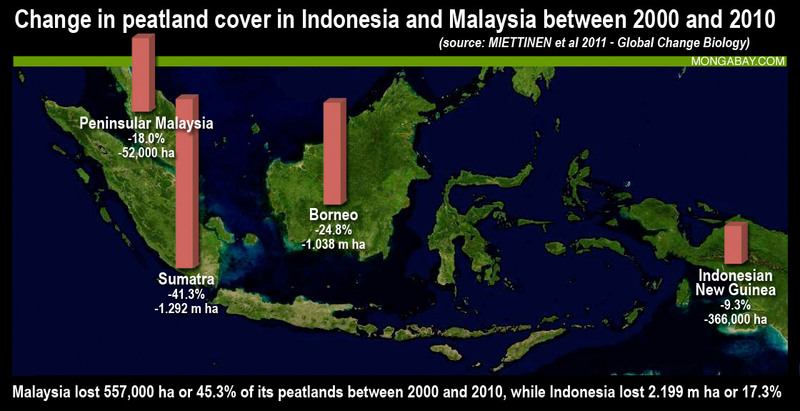 Graph: Change in peatland cover in Indonesia and Malaysia between 2000 and 2010. Background satellite image courtesy of Microsoft/Bing Maps and NASA, design by mongabay.com. Click image to enlarge. 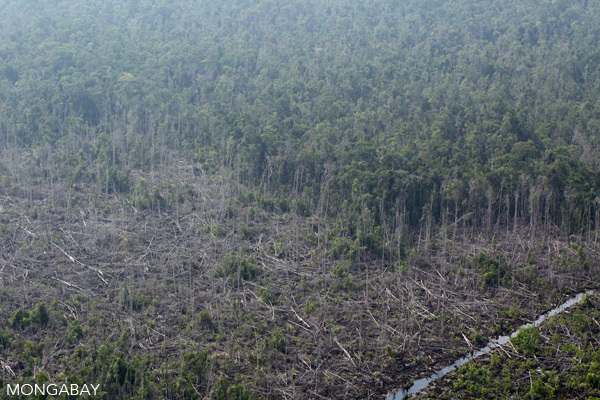 The bigger picture is that about 10 percent of Indonesia’s land area consists of coastal peatlands. If all these are developed, drained and ultimately became inundated, Indonesia will simply lose a large chunk of its land area. What were once functioning forest ecosystems with important local roles in providing non-timber forest products and services such as flood buffering to local people, will now be ecological and economic wastelands. All this is happening without taking into consideration rising sea levels, which will likely exacerbate the loss of Indonesian land to water. It is obvious that a much better understanding is needed of the impact that peat decomposition has on long-term economic development in coastal parts of Sumatra, Kalimantan and Papua. National and regional governments should carefully rethink their strategy with regard to use and protection of these coastal peats. For a more sustainable future, the authors of the study recommend a transition to alternative uses of peatlands that can operate without artificial drainage. A transition to low-impact land uses is needed well before flood risk has increased so severely that not only use as plantations but also regeneration of peat swamp forest will be impossible. Remaining degraded forests should be conserved and rehabilitated to form the core for the development of sustainable peatland production landscapes without drainage canals. Government, companies, and communities alike need to realize that draining coastal peatlands for agriculture is a high-risk strategy that is ultimately likely to reduce rather than promote rural development and poverty alleviation. The science is there to substantiate all this. Now policy and management changes are needed to effectively do something about it. Erik Meijaard is a Jakarta-based conservation scientist coordinating the Borneo Futures Initiative. This op-ed originally appeared in the Jakarta Globe and has been reprinted here with the permission of the author.